You’re traditionally published – Congratulations! You’ve convinced agents, editors, and acquisitions execs that your story is worth the investment – Fantastic! Now you’re going to pitch it to film and TV execs looking for new IPs to develop for visual media – That could be great…. What can you do to help make it great? – How to construct an accessible, attractive Pitch Package. – How to ‘take a meeting’ that presents you and your story in the best possible way. – How to interact positively with the producers and development execs to make them want to work with you. We’ll go through the steps to develop, craft, and polish your pitches so the media-makers want to keep your leave-behinds, show them to others in their company, and then hopefully move forward with enthusiastic interest on your story. This interactive workshop will include the opportunity to pitch your project for direct feedback from the instructor. Lunch is not included with the event, though we will take a break from 12-1. Grab-and-go meals will be available at Zeidler’s Cart as the Skirball Center’s “Zeidler’s Café” will be closed for a décor and menu refresh. Watch for signs indicating the temporary new location for cart service. Also feel free to bring your own lunch. PAMELA JAYE SMITH is a mythologist, author, international consultant-speaker, and award-winning writer-producer-director with 30+ years in features, TV, music videos, commercials, documentaries, web series, corporate and military films, and VR. 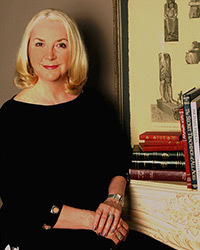 As a story consultant she works with writers of novels, screenplays, short stories, memoirs, and narrative non-fiction. Besides her own works she writes for others, coaches writers and actors, and helps individuals discover and use their personal archetypes. Pamela authored 5 books for media-makers, is co-author of two children’s books, Petra Volare and Skruffy the Teenage Polar Bear. Credits include Fox, Disney, Paramount, Microsoft, Universal, RAI-TV Rome, UCLA, USC Film School, American Film Institute, Women in Film, Natl. Film Institute of Denmark, LA and Marseille WebFests, Romance Writers of America, Children’s Book Writers of Los Angeles, Jaipur India Intl. Film Festival, Rocaberti Writers Retreat, and many media festi­vals and story conferences. You must be a SCBWI PAL member and logged in to your SCBWI account to register for this workshop. Registration opens Saturday, March 16 at 9am.